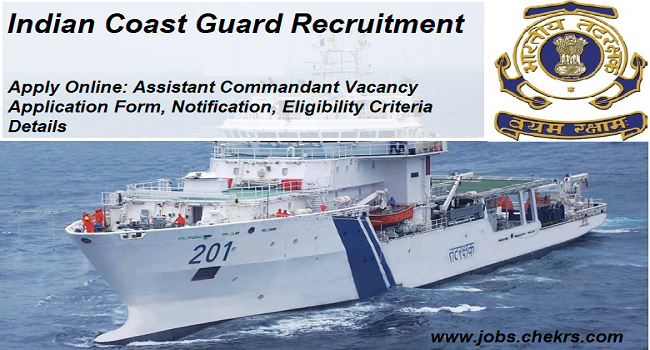 Indian Coast Guard Assistant Commandant Recruitment 2019 (भारतीय तटरक्षक सहायक कमांडेंट भर्ती 2019- ऑनलाइन आवेदन, अधिसूचना) The golden opportunities for young and interested candidates who are want to get the Defence Jobs. Indian Coast Guard, Ministry of Defence has announced the Indian Coast Guard Recruitment Notification to fill up the Assistant Commandant Posts. Eligible and well-skilled candidates are invited for Indian Coast Guard Online Application using official website. Candidates must complete the application process from before the last date for the Indian Coast Guard Assistant Commandant Recruitment. You can check here all details such as eligibility, the application process, age limit, selection process and more details about the Latest ICG Jobs. Latest Update: Indian Coast Guard is going to release the Assistant Commandant 2019 Recruitment notification for various vacancies. Interested aspirants can fill the application form before the last date. (भारतीय तटरक्षक भर्ती अधिसूचना) Every year Ministry of Defence releases various posts in the Indian Coast Department to fulfill the vacant seats. Now, it is going to recruits the candidates for Assistant Commandant Posts. Here we have provided the official notification details. You can check all details and Apply Online for available posts before the last date. Eligible candidates are invited for the online application form for the Assistant Commandant vacancy. For the application form, candidates go to the official website and should complete the process between the last date. During the application process, candidates should deposit the application fee via online mode. You can also check the Indian Coast Guard Jobs details from here. Candidates who are wanted to work with Indian Coast Guard Department then can apply for the Indian Coast Guard Vacancy Application Form via online mode. Before applying, firstly candidates must check their eligibility for the required field. Candidates should hold the Bachelor’s Degree of recognized University with minimum 55% marks in aggregate. Mathematics and Physics as subjects up to intermediate or class 12th of 10+2+3 scheme of education. Candidates must be born between 1st July 1988 to 30th June 1997 (Both dated inclusive). Candidates need to visit the official website of Indian Coast Guard. Go to on “opportunities “button and click on it. Filling up of information like personal email ID and Mobile number for the registration. Select the post applied for- Assistant Commandant. Candidates have to upload the photograph and signature in the prescribed format. After complete the application, you can check your filled details once again prior to clicking on the Submit button. Indian Coast Guard published employment notification to appoint the candidates for Assistant Commandant Jobs. To receive more alerts on Indian Coast Guard Recruitment 2019 keep visiting our site www.jobs.chekrs.com. We will provide you the upcoming Indian Coast Guard Notification. In the case of any query or review, your valuable comments are most welcome in the commenting section below and our team will get in touch with you shortly.